The book explores the battle between Western and traditional approaches to Sanskrit and sanskriti (civilization). 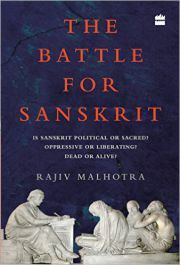 It exposes the dominant Western scholarship, in particular its subversive allegation that the Sanskrit heritage has been a political weapon for social oppression. Without adequate critical inquiry,Indian English-language elites have internalized such lopsided ideas and enshrined them in various mainstream institutions. Controversial and thought-provoking, the book proposes a set of debates for the intellectual kurukshetra (battlefield) pertaining to the social, political, historical and contemporary dimensions of Indian sanskriti. It is intended as a wake-up call to the traditionalists and seeks to inspire a home team to pursue such debates.